A school trip is a great way to keep students excited about their learning! 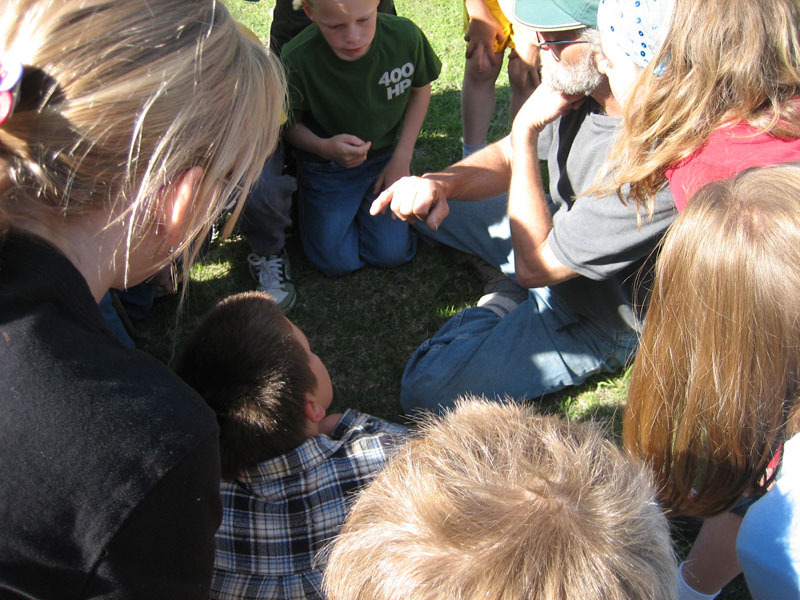 Room to Grow can facilitate an educational experience for your students. We have hosted students of various age levels and areas of interest. The following lesson plans are just examples of how a trip to Room to Grow could fit into your unit planning. Overview: Students will feel/smell/touch a variety of soils, plant seeds, and transplant seedlings in a greenhouse environment. Outcome 3-1-02: Students will observe, compare, and contrast the structure and appearance of several different types of plants. Outcome 3-1-03: Students will show respect for plants as living things. Outcome 3-1-10: Students will care for a flowering plant throughout its life cycle, tracking its growth and changes over time. Outcome 3-4-02: Students will identify and describe components of soil samples collected at different locations and depths. Materials: Greenhouse, black soil, compost, sand, flax straw, peat moss, vegetable and flower seeds, pots, water, vegetable and flower seedlings. Introduction: Students will walk through the greenhouse, observing the different types of plants that are growing and the different stages that the plants are at. They will see the soil mixer, germination incubator, the transplanting area, and the various plants set out to grow. Students will raise any questions that they have about the greenhouse tour, and discuss answers together. Students will be able to feel a sample of black soil, compost, sand, and broken down flax straw. We will discuss where these soil ingredients come from, and what they contribute to a healthy soil mix. 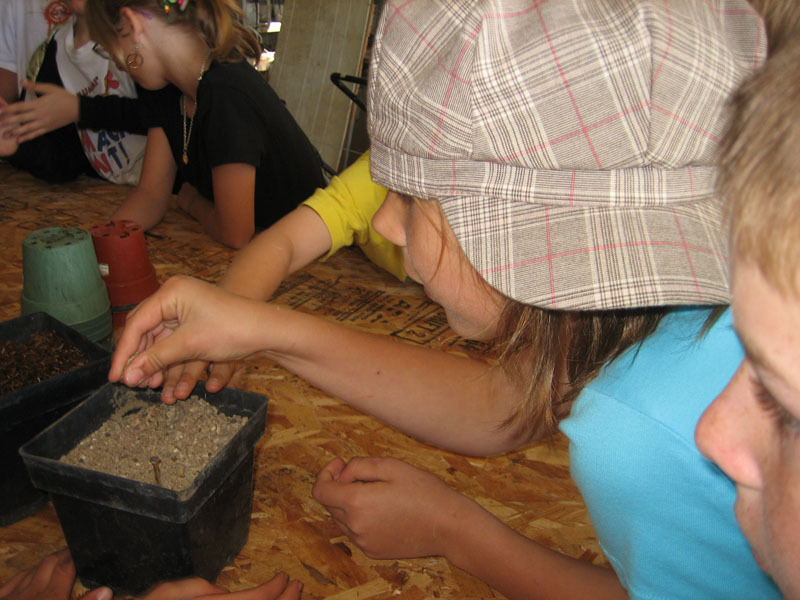 Students will plant a seed of their choice into a soil mix, and water it. Students will transplant a seedling of their choice into a larger pot, and water it. Care of growing plants will be discussed, including the importance of water and sunlight. Students will be able to take their plants with them and continue to care for them at home or at school. Evaluation: Students will care for their plants until they can be transplanted into their home gardens, or until they flower or produce fruit in class. Conclusion: The class can end with a tour of a garden where the plants are already growing outdoors, or with a review of taking care of their plants. Overview: Students will tour a house made of straw bales and a house made from a recycled church, and view solar and wind power in action, a wood boiler heating system, composting toilet, and other examples of sustainable living. Outcome 2 a) Students will differentiate between renewable and non-renewable resources. Outcome 6 a,b,c) Students will define solar energy, differentiate between passive and active solar energy, and discuss the advantages and disadvantages of producing electricity from solar energy. Outcome 9 a,b) Students will describe how the wind can be a source of energy, and discuss advantages and disadvantages of wind energy. Materials: Straw bale house, recycled church house, solar power, wind power, wood boiler, composting toilet, ‘hot’ box, etc. Introduction: Students will be given a tour of the straw bale house and of the recycled church house. Students will hear the rationale of building choices that were made, and will ask questions as they arise. Students will see a variety of other energy saving devices, including a composting toilet and ‘hot’ box that cooks food without a continuous source of heat. Students will respond to their observations and discuss pros and cons of using these devices. Evaluation: Students will return to school, and design a model of a home, making energy choices, and offering a written rationale for their choices. Conclusion: The lesson will conclude with a tour of the conservation dam and interaction with whatever puppies and kittens we happen to have at the time. Title: Appreciating Habitats of Wild Animals, Birds and Insects. Overview: Students will get up close with a variety of habitat – beaver, ants, horses, mushrooms, deer, human – and discuss how their needs and offerings differ to form a complex community of communities.